The Cakewalk/Roland partnership has resulted in a flexible, feature-packed device that oozes quality. Built-in mixer. Flexible audio I/O with great preamps. Useful control surface. Ofers standalone mixing/recording. Rich software bundle. Limited as a control surface. Recorder disabled when USB is active. For the modern musician, the computer often fulfils multiple audio roles, and if your musical activities extend beyond the studio, that usually means carting around not just your computer, but a suitable audio interface and perhaps a controller, too. Cakewalk's collaboration with parent company Roland has thrown up a potential solution, though, in the form of the V-Studio 100, a compact package that's not only an audio interface, but also a controller and standalone recorder. It works with Windows and Mac OS X, and comes bundled in a healthy collection of software, too. Like its much bigger (and pricier) sibling the V-Studio 700, the VS-100 is a USB 2.0 device (though not a bus-powered one) that combines numerous technologies in a single package. It's got audio inputs and outputs, plus a basic mixer, flash recorder, control surface and even a motorised fader thrown in for good measure. Naturally, a few things have been left out in order to squeeze all of this in, but the compact VSf100 is a surprisingly well-equipped unit. Plugged into your computer via USB, the VS-100 provides a versatile set of inputs and outputs. On the front are balanced mic and line ins with preamps and dedicated level controls, plus a high-impedance switch for guitars on the first input. On the back are two more balanced mono ins and an unbalanced stereo phono pair, for a total of six analogue inputs, and there's a stereo digital input, too. As for outputs, the V-Studio 100 has four balanced and two unbalanced channels, with the unit running at up to 24-bit/96 kHz. There's also MIDI In and Out, plus phantom power for mics that need it. "Whether connected to your computer or running standalone, the VS-100 doubles as a mixer." Some audio interfaces offer more connectivity for your money, but the V-Studio 100 provides an optimal set of ins and outs for everyday usage. Most importantly, the preamps are clean and transparent, which is especially nice given the price of the box. Whether connected to your computer or running standalone, the VS-100 doubles as a mixer, with hardware knobs for controlling channel levels/panning and the onboard digital compression, EQ and reverb. In addition, the audio interface can mix signals direct to the output without any latency introduced by routing the audio through software. Some competing audio interfaces offer similar functionality, but they typically lack the hardware controls that make mixing on the VS-100 so easy. A 100mm motorised fader for adjusting the level of the active track, buttons for markers and track controls, an assignable encoder and a transport section are onboard. Because the VS-100 supports the Mackie Control protocol, it integrates with non-Cakewalk DAWs like Logic, Pro Tools, Cubase, Reaper and Live. If you're a Sonar user, though, support for Cakewalk's ACT (Active Controller Technology) intelligently and automatically maps the additional controls on the mixer portion of the VS front panel. The unit is fairly limited in comparison to other models, as there just aren't that many physical controls, but it does a good job of covering the basics, whether or not you use Sonar. If you like to travel without lugging a laptop about, the VSf100 is a worthy addition to your kit bag. The mixer functions and effects all work independently of USB, so you can carry just the device and its power supply. There's an onboard wave recorder, which uses SD flash memory cards; and with SDHC support, you can easily add gigabytes of storage for recording whole live sets or rehearsal sessions. The recording is stereo only, but coupled with the mixer, you could easily capture a full band mix. Like Roland's mobile recorders, there are also marker and loop functions - useful for practicing certain sections of an arrangement or queuing up backing tracks. There's even a metronome. "If you like to travel without lugging a laptop about, the VSf100 is a worthy addition to your kit bag." The bad news is that the flash recorder is disabled when the unit is plugged into the computer, so you can't record the output of the mixer or make SD recordings of your laptop or band performance with the USB connection active. Cakewalk says that Roland is aware of this drawback and is investigating whether a firmware upgrade could resolve the issue. The V-Studio 100 comes with a generous software bundle for Mac and PC. There are the Cakewalk Studio Instruments, comprising bass, drum kits, electric piano and strings, which sound pretty and have a lovely GUI to match, plus Guitar Rig 3 LE. The effects really stand out, adding genuine value to the bundle. The VXf64 Vocal Strip is a surprisingly powerful combination of a terrific-sounding deesser, compressor/expander, tube-emulating equaliser, doubler and synced delay. Vocalists often get left out of software consideration, but here they get a rich rack of tools for recording. The Boost 11 Peak Limiter provides a nice mastering limiter, and Channel Tools offers indispensable utilities like L/R swap, stereo and mid-side adjustments for recording stereo mic pairs and delay. 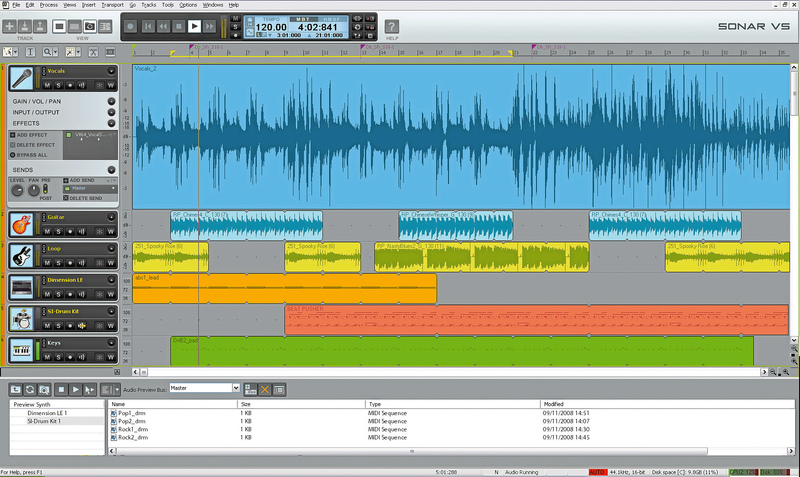 There's also a special edition of Sonar (for PC only), called Sonar VS. For those seeking a new tool for multitrack recording and arranging, this is a strong choice, as it feels like a full-on DAW and not just a bundled extra. The interface is clean and straightforward, being user-friendly but without sacrificing any serious functions. It certainly contains everything most users will need for audio/MIDI recording and arranging. It's hard to deny the value of the VS-100. The audio interface alone is a winner for its great preamps and rock-solid Mac and Windows drivers, especially when combined with the utility of a flying fader and transport buttons. 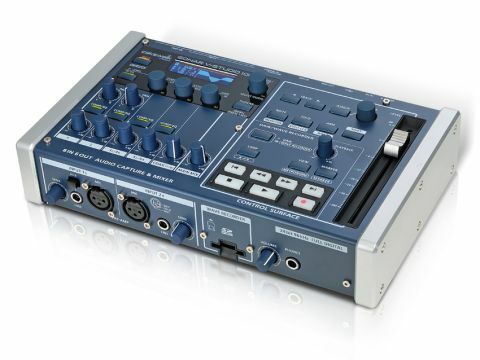 Throw in a basic mixer with real hardware controls and a fine software bundle, combined with the ability to mix and record even without the computer, and the VSf100 is a near-perfect do-everything box. You may want to look elsewhere if you're primarily interested in audio I/O, or if you prefer a dedicated control surface and/or mixer, but otherwise, this could well be the home and mobile producer's best friend.